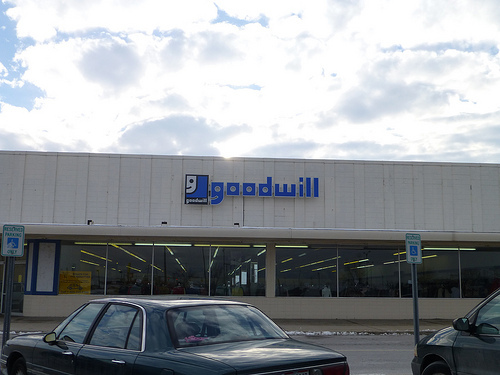 You’ve probably all heard Macklemore’s “Thrift Shop” by now, but have you ever tried shopping at a thrift store, or “thrifting”? Or have you ever consigned your clothing or engaged in a ferocious bidding war on eBay? 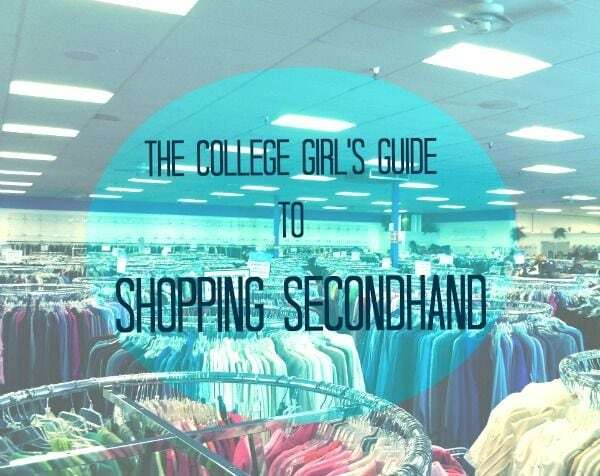 For the fashion-focused college girl, secondhand shopping is an amazing way to fill your wardrobe with great clothes and accessories without emptying the bank. While “Thrift Shop” made secondhand shopping out to be totally grungy, it doesn’t have to be that way! More thanhalf of my closet was purchased at thrift and consignment stores, and it consists mainly of classic brands like J. Crew, Club Monaco, Theory, Madewell, and even some designer stuff! It’s eco-friendly. By purchasing secondhand clothing, you’re recycling in the most stylish way possible. It’s a great source of inspiration! Sometimes I’ll spot a vintage or totally unique garment at the thrift store that I might never have thought to try on at a normal retail store. Coats and Jackets. Wool coats, trench coats, and leather jackets are usually in good shape even if they’ve been well-loved in the past. Woven Tops and Dresses. Silk shirts are an especially worthwhile find, since they’re usually pretty pricey new. Dress clothes: blazers, trousers, skirts. Beyond the scary shoulder-padded ’80s, corporate wear doesn’t really undergo dramatic changes. Even if a pencil skirt is from seven seasons ago, it’s probably almost exactly the same as one that’s in stores now. Special Occasion Attire. Chances are, that fancy cocktail dress or gown was only ever worn one time. Accessories. Since purses and scarves don’t go through as much wear and tear as clothes, you can often find great pieces in terrific shape. Unless it’s brand new with the tags still on, most secondhand knit clothing (e.g. tee shirts, thin sweaters, jersey anything) won’t be in great shape. Even high quality knits tend to pill, snag, tear, or stretch out after a year or two of wear. This one shouldn’t need further explanation, but do make sure to check for any stains that might be lurking, especially in the armpit region. Some alterations are easier than others: if all you need to do is shorten the hemline or replace a button, go for it! But if that dress needs to have the bodice taken in, the neckline lowered, and the sleeves slimmed down, it might be more work than it’s worth. While a DIY is always fun, it’s easy to get carried away and swamped with “projects.” I’ve fallen into this trap too many times – I’ll find a piece with a fun pattern or great fabric or cool detail and completely overlook the fact that it just doesn’t fit me. While I occasionally do get around to the alterations, more often than not my exciting purchase ends up gathering dust in my closet. Although thrift stores usually price their products pretty low, some consignment stores or eBay sellers might list an item at a higher percentage of the original price. If you want to make sure you’re getting a good deal, look up a description of the item (e.g. “gold sequined dress + “brand name on garment”). Big retailers, like J.Crew or Old Navy, usually put a product number on the tag. If your Google search turns up empty, see if you can find out what other similar items from the same brand are going for so you have a point of comparison. 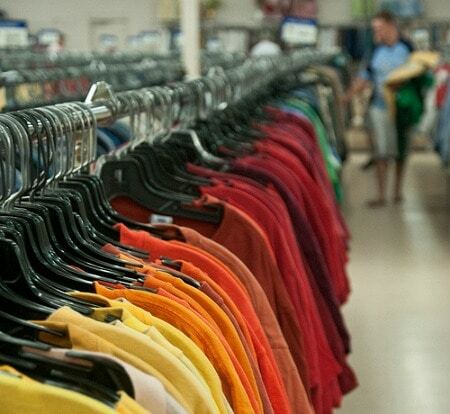 Some thrift stores offer student discounts and others have discounts based on the day of the week. Most thrift shops I’ve been to have offered dressing rooms, but some don’t. In that case, wear form-fitting clothes on your shopping trip so you can slip things on over them to see how they fit. At consignment stores, the staff has gone through the items brought in by sellers and selected only the pieces that they think will sell. This means that a lot of the junk has been filtered out for you! On the flip side, consignment stores are usually more savvy about the value of the items, which usually results in higher price tags. Many consignment stores offer discounts based on how long an item has been in the store; for instance, at The Closet, a posh resale store in Boston, clothes are 25% off after 30 days and 50% after 60 days. If you can wait it out (and willing to take the risk that someone else won’t scoop up your treasure first), patience can lead to a real score! 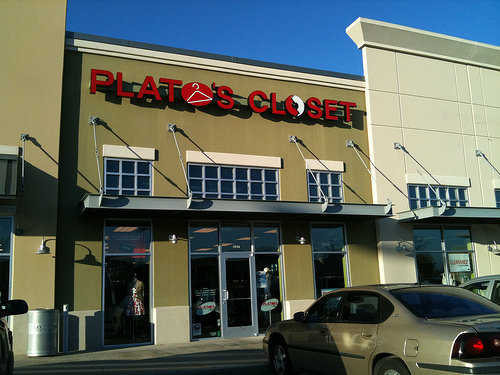 If you have clothes to consign, a Buy/Sell/Trade place, like Buffalo Exchange, Plato’s Closet, or Second Time Around, will let you choose between getting paid in cash or in store credit. Typically, you get a higher cut of the selling price if you choose store credit. This can be an easy way to refresh your wardrobe without actually spending any money. 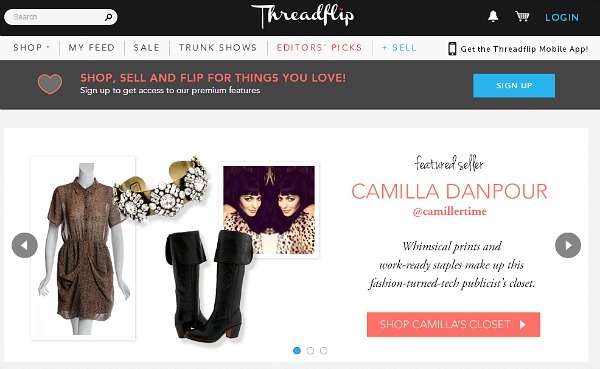 While I can’t vouch for the other sites, I’ve purchased from Threadflip several times and had a great experience. Online consignment is essentially the same as at a brick-and-mortar store, but you can filter for brand, size, color, etc.. Although you can’t try anything on, you can always ask the seller for measurements or additional pictures. Like any other e-retailers, you can join the e-mail lists for flash sales or members-only discounts. If you’re in the market for a designer purse or accessories, online consignment is a great choice, since many sites offer refund policies if the item turns out not to be authentic, or they will authenticate items themselves. I’ve definitely spent hours just perusing the infinite listings on eBay, but it’s best if you have a particular item in mind, say, that Anthropologie dress last season that you were absolutely in love with but had a price you just couldn’t justify. It’s always worth doing an eBay search to see if you can snag it on sale! 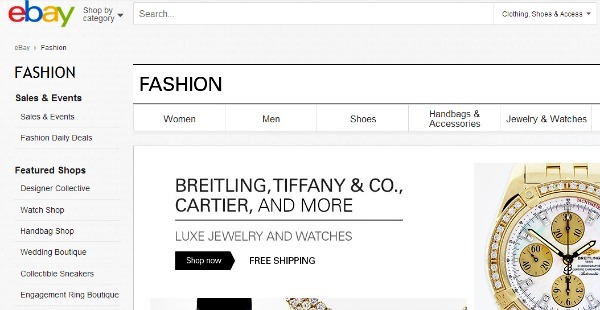 Be familiar with eBay lingo: for instance, NWT means “new with tags” and NWOT means “new without tags.” Always make sure that the seller you’re buying from is reputable. Do you shop secondhand? Would you try it? Do you have any tips of your own to share? Let us know in the comments!